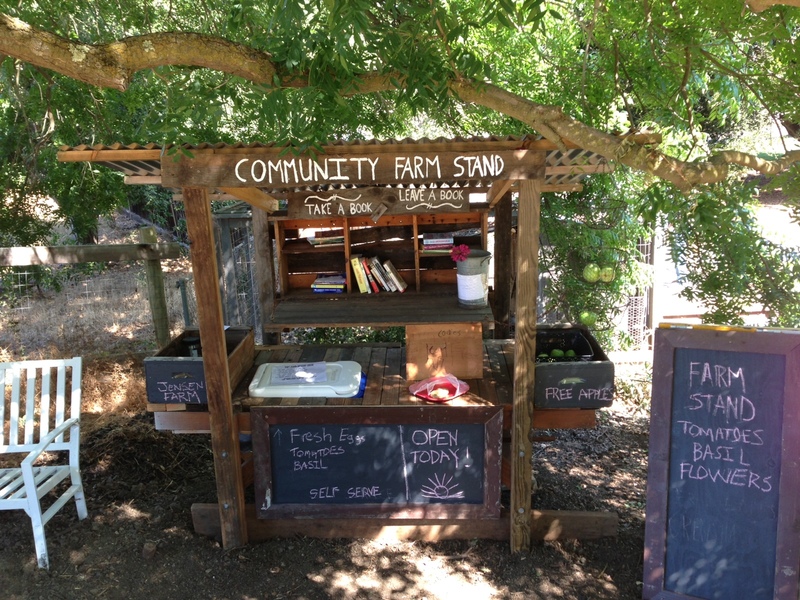 In September 2013, I erected my first farm stand in Los Altos Hills, California. The address of the farm stand is 14101 Manuella Rd, Los Altos Hills, CA 94022. The farm stand is actually located on Fremont Road since this property is a corner lot an borders Fremont Rd and Manuella Rd. We built and assembled this farm stand on a fairly busy road in Los Altos Hills at a friend’s house and on their property. Initially the farm stand was located slightly in the road right-of-way. The city requested that we move it back fully on the property and the farm stand was approved by Los Altos Hills city staff. Options to sell or give away local extra produce from the neighborhood gardens and fruit trees to the neighbors! Options to give away for free food items harvested from the neighborhood. Plans to search out neighbors that have extra fruit tree harvests and find groups that can pick them and put them at the farm stand for free or for donations. Comfortable place to stop and meet in the community as a community, pedestrian/bicycle hub. As the seasons change, neighbors orchards will be providing a continual stream of locally harvested food items with a low carbon footprint!